It's been two years and two months since we lost our first baby in a "missed miscarriage." Yes, much has happened since and the Lord has given me such peace and healing. It's been a long time since I've mentioned our baby Gabriel on this space but I recently have encountered many women both distant & close experience the same loss. If you're just now facing the storm of losing a baby, hear this: It eventually gets easier to take on each day. You eventually will have a day of very few tears. Then, you'll feel badly about not feeling badly. It's a torturous cycle. Eventually, you'll stop noticing every pregnant woman within a mile of you and wish you were her. Eventually, you'll find peace. For this, I hope for you. But hear this too: Though the days, months, & years pass... Though you add more children to your family... you'll never forget that baby. The hurt, heartache, pain, feeling of emptiness will never fully leave you. You may always look at your family photo of 3 and think there should be 4 (or one more). You'll never forget that day that you said goodbye or that day you were supposed to say hello. Your mind will still count the years your baby would have been. Your heart will still ache to meet him or her some day. It just will. Lastly, hear this: You'll be okay. Eventually. You may miss and mourn. Do so. It's healthy. The Lord gave you a heart to be a Mother. A Mother, you are. No matter what others say, no child will replace the one you lost. But, your loss will only make you a better mother. Because you know what it is to love and lose. You know from the deepest depth of your soul what it is to wish time would rewind... Or speed ahead to eternity where you can re-unite with your child. YOUR child. You are Mom. And Lord-willing, you will hold a baby of your own this side of Heaven. But that doesn't help to hear; this I know. As difficult as it is when folks say, "you'll have another one, it'll be okay," give grace. They don't know. And, the curse of miscarriage (& infertility) is being in community. Because others don't know what to say or how to say it. It hurts. Seeing others with child hurts. But, that's our human nature: to want what we can't have. Mama, give yourself time. Give others grace. Let yourself cry. Bring up your loss with others and talk about it. It helps. Ultimately, permit yourself to hold that baby close to your heart. Give yourself permission to cry less and less each day and be okay. Eventually. Give yourself permission to love better and bigger because of that sweet baby you lost. To those who want to help, hear these words: We want our babies to be remembered. They were real, living, heart-beating, tiny-legs-kicking human beings. They are our babies and we love them dearly. It's okay to ask, "How are you feeling today? What has been on your mind and heart?" A couple of friends were so loving (& still are) to call my baby by name and intentionally ask how I was feeling. The sweetest gifts two dear friends gave me were a necklace and bracelet with a little G initial. I clung to those in a way I can't even explain. It's okay, in fact, it's fantastic to bring her a meal. As not only her mind and heart recovers from miscarrying, but her body too (whether it meant that she needed a D&C surgery or miscarried on her own), the last thing she'll feel like doing is making dinner for her and her family. Remember that though you may not have seen a big baby bump, much was going on inside and she needs time to heal and recover. Since not easily seen, this is often forgotten. She won't be able to sleep well. She'll be emotionally exhausted going through the stages of grief but find it difficult to put her weary mind at rest. Bring her coffee, flowers, send a card, a thoughtful note... Just recognize what happened and let her know you care for her and her breaking heart over the loss of her baby. A little goes a long way. 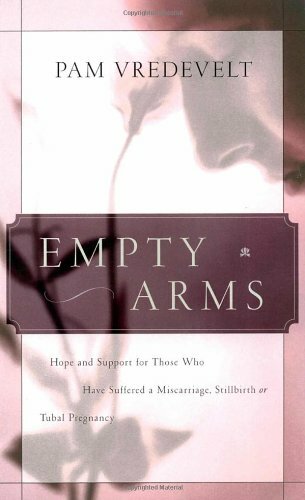 Empty Arms by Pam Vredevelt.